WELCOME to the 4th annual "December Winter Wonderland" contest/challenge. This years theme will be "Once upon a time, fantasy and fun" but with a twist. I want you to take characters in literature, film or stage, and tell a story about them that we don't know, like "the Ice Princess had one thing that would warm her heart, her little baby Iciss". And since it's December, it must have something to do with winter or December in it. It can be real stories or not but it has to be fantasy type stories. You will be judged on how close you have followed the theme as much as how much you catch the judges eye with your render. the standard contest rules will be upheld this month here is the link http://www.daz3d.com/forums/discussion/286/ with a couple exceptions. In regards to rule #1, I will allow 8 minimum for free items, #6, I WILL allow all Morph++ free this months only, and rule #11, I'm going to give a limit of 3 renders per person. Contest will end the usual time and day end of the month midnight as always. I'll need 3 suckers... er I mean volunteers (LOL) just kidding everyone, judging can be fun. Just ask us. music2u4u will be donation his Santa’s Workshop again this year and also donating his department store Santa display as well. Something new this year. Mavelle a floor lamp - a vitrine-cabinet - window shaders who can be opened and closed even the blinds can be opened like real ones, and the refrigerator, all based on her own furniture. WELCOME to the 1-hour snowman mini render challenge. for those of you that have never tried the 1-hour mini render, now is the time. The winner will get a $5 DAZ GC from me as well as his Santa sleigh with gifts included from music2u4u. The render I posted was what gave me the idea for this challenge. I was able to do it in under an hour. The rules are simple, there are no rules... well maybe a couple of them. 2. You must post before you start your render letting us know you are entering the challenge so that the DAZ clock will show what time you start, and you must post again before the hour is up with your render done. If you fail to get it done within the hour, then it doesn't count. You can try again, but you have to make a completely different render. 3. YOU MUST START OUT WITH A BLANK PROGRAM WHEN YOU BEGIN THE CHALLENGE, once you make your first post then you can go back and start adding your props and stuff. I have no way of knowing if you cheat or not so you are on your honor in this one.You can use any combination of paid or free items, all paid, all free, it doesn't matter. Know I can hear you all saying, "there is no way I can get everything together and render it in under an hour". Now here are some tips to help you achieve this in under an hour. winner will be announced some time on Monday the 10th. Will this also allow the counterpart for Genesis, Genesis Evolutions? I'm fine if it doesn't since I have other options but just curious. I don't use DS so am not sure but if is the equivalent to the Poser ++ morphs then yes . It appears that it is from the link. oh yeah, can anyone do me a banner for Dec, music???? anyone??? Are we allowed to use past Daz Christmas freebies? I do not believe they are currently available. You can use them; but you can't put them toward your freebie total. Cool theme Jeepz I like it. thanks Mavelle, I was inspired by the USA TV show called Once Upon A Time, I love that show, and we rarely do fantasy themes. And druc, when it comes to things that aren't available, we have a category called doesn't count items, those are the ones that were once free but are no longer available, as long as they aren't being sold somewhere they fall under this category . Oh I know... working on your ideas for the mini challenge???? the main contest???? 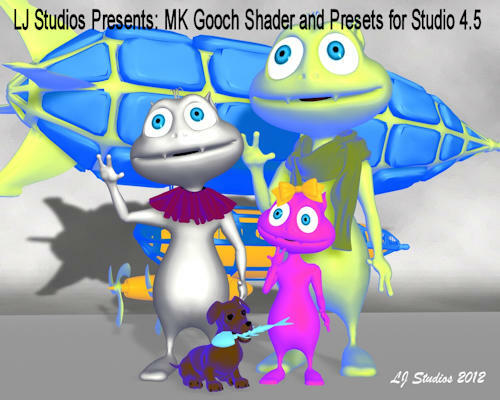 Here is a picture of the Gooch shaders for all who enter the contest. This shader is a little different than the one in the tutorial. Rules added to the December gallery page. The 1 hour sub-gallery will go active in the morning. One quick question...is it bad that I had to download my own free runtime file structure because I can't remember how to set it up anymore? Have I been away THAT long? Are the runtimes even the same is DS 4.5? For Poser items, yes. For anything that is made particularly for DS 4.5, it's a little different. Although I can't tell what all the rules are, because some things will install into the Runtime, but some things want to go into that My Library folder setup. I finally gave up on using DS 3.something. It kept crashing, wouldn't render, and I couldn't find anything in my library and since I have 4+ years of crap I really didn't want to manually sort it all. looks like I'll have to. Another question, could something like textures be made in 4.5 but packaged to be used for all versions and for poser as well? I wanted to make some freebies again, and you guys are usually the most help to me. OK, lets kick this little game off, and I hope I have complied with the rules. Mrs Clause Snr clothes were a past Daz Christmas freebie, no longer available as a freebie and hairs is GnomieBunsLD, also a past Christmas freebie. Ground is a Daz plane sent to Hexagon for the ridges at right, then made a SubD object to smooth the ridges. Snow at the left corner of the house was a pane created on hexagon, also a SubD object. 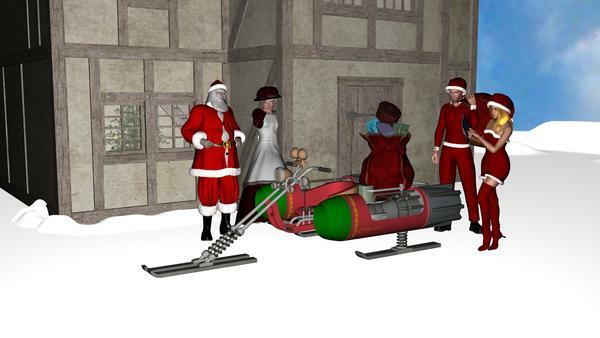 Sorry, I forgot to add the little "story"
As Mr Claus senior watched his son prepare for his first offical outing, he wondered what "units per hour" had to do with this annual trip. After all it was magic that allowed his ever faithful raindeers, led by Rudolf, to deliver gifts to all the nice and not so naughty children of the world. 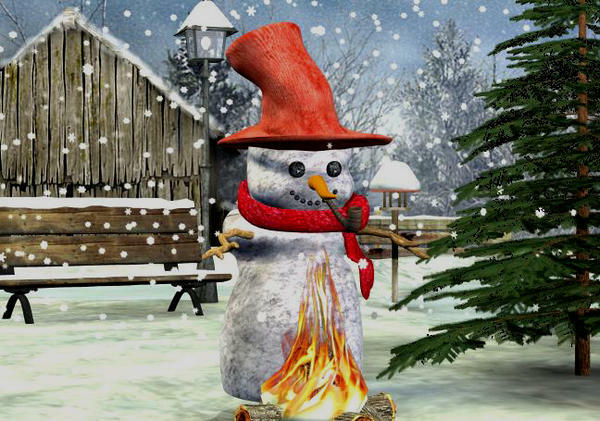 Alzimers must be settling in, I forgot to add Santa Jr's clothes. great take on the theme druc, all links are good, glad you added the story to it, the only suggestion I have is to put the links that are extra in a separate spot in your post, that way no one confuses them with the counted freebies. now you should try the 1-hour mini. I'm still looking for 3 judges for this month. Remember, you can still enter if you are a judge, just can't vote for your self. and looking for someone to do my banner this month please any takers?? I will volunteer to be a judge jeeperz. OT - hi everyone! Just wanted to drop in and say hello... and share some news. I had been in and out of the hospital pretty much the entire first two weeks of November. But on November 15, when I was admitted to the hospital with severe pre-eclampsia, and the doctors decided to induce me. The medication for induction didn't take, so on Saturday, November 17, I had a c-section and gave birth to my little son, Jesse. He was 5 weeks early, 4lb, 7.6oz and 19 inches long. He was in the NICU for 12 days, and on Thursday evening, my husband and I took him home for the first time! So... we're home now, and I'm sure I'll have a little bit of free time to come back and start participating in contests again. I've missed you all terribly! 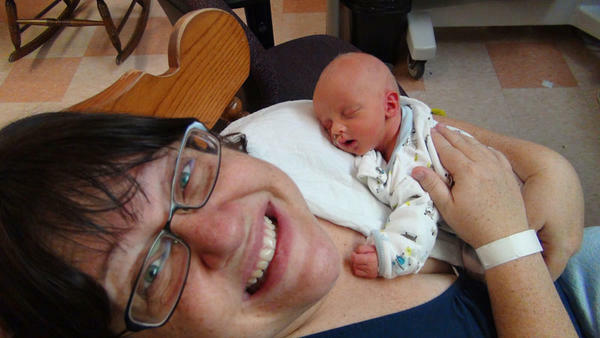 Here's a picture of me with him when he was in the NICU, he was about a week old here.